I wanted to catch up on some material that I have taken over the past couple of weeks. As of today, I have three more months in China. The time is flying by so quickly. 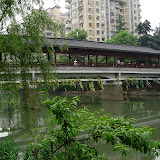 Click on the picture below to see some pictures of Hangzhou. This is a great looking city...full of trees, parks, and water. These pictures were taken on a day I went there for work. Below the text are some videos that show some of the scenery of city life. They are not too exciting, but give you a little taste of China. This past weekend was very busy. After dinner on Friday, I went to my second expat bar. If you don't know, these bars are where expatriates (working foreigners) go to hang out with each other. A bunch of locals got on stage and jammed a bit, which was nice. I woke up the next day and did not want to move! However, by noon I was up and off to meet a co-worker for some soccer. We took his scooter. I had been wanting to ride on one anyway, so this was perfect. He even let me drive it a little. We played soccer and then basketball. This was the first time in my life that I was the tallest person on the team and the first time that I can say that I "skooled" someone else in basketball (probably the last time too). It was great! Sunday the fun continued with a couple of games of softball. When I arrived at China's official baseball park in Wuxi, I quickly realized it had been years since I played baseball. My team, Wuxi Life, won our games, but no thanks to me. I managed to make contact with the ball twice out of four times at bat, but was quickly gotten out each time. I will work on it a little before next weekend, so that I may contribute more than a warm body on the field. Finally, in the food department I have recently tried pigs feet and chicken feet. I would eat the pigs feet again, but the chicken feet just didn't do it for me. I keep trying to put myself out there and experience China. Trying foods has never been a strong point of mine, but I constantly remind myself to go for it! This video was taken from one of the many walkways in Shanghai that go around all four corners of the street. They require you to walk several stairs to get up and down them, but you don't have to worry about all the traffic below. This video shows one of the many parks in Hangzhou. This city is within 1.5 hours of Shanghai. I really like the place. I hopefully will return to see a few more things there before I return to the States. This last video shows the morning commute in Hangzhou. I love seeing all the bikes. The scooters in China are required to be battery powered. While electricity is not generated in a clean way, at least you are sucking in the fumes of the person's bike right in front of you. Enjoy!! Hey David! Shanghai looks really busy... it seems like biking is a good alternative to move around the city! What is that smell? Oh, its just the water.